UNT's student-athletes are ready to win on the field and in the classroom. UNT athletics' plan will get them there. UNT's Green Brigade Marching Band uses teamwork and talent to add excitement to fall football. Alumni working as broadcasters in the DFW area connect to audiences with deliveries that resonate. Alumna uses leadership skills to grow energy finance divisions for leading U.S. banks. Lee F. Jackson to retire after 15 years of service and Lesa B. Roe named UNT System chancellor. Kaylie Hardeman ('13), a freelance percussionist, says her job doesn't feel like work. Kelly Pound manages exhibits for State Fair of Texas visitors that are sure to entertain. John Turner's ('57) time as a UNT student paved the way for a successful career. As a student, Rebecca Vincent ('05) passed the Foreign Service Officer Exam on her first try. UNT athletics headed to Houston to deliver relief supplies to those recovering from the storm. Shengli Fu, associate professor and chair of electrical engineering, was awarded an NSF grant. 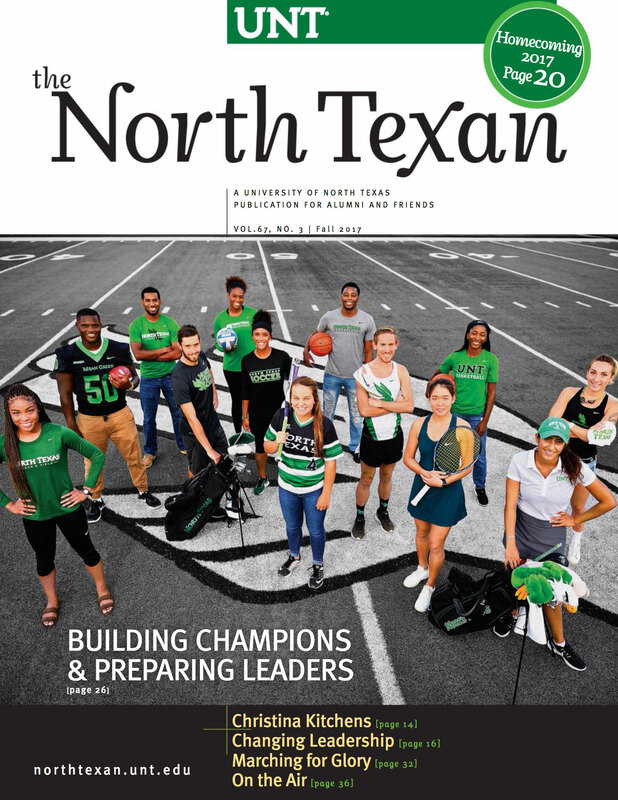 The UNT Alumni Association is offering a series of events through the fall so alums can reconnect. Diana Berman received the Ralph E. Powe Junior Faculty Enhancement Award this spring. I may have left Denton many years ago, but many wonderful memories remain. A faculty member, graduate student and undergraduate student were recognized for innovation. Calling all alumni and friends home to UNT to celebrate during Homecoming 2017. Elizabeth Burgin, a doctoral student in the College of Education, was named a Tillman Scholar. I attended the Coaches Caravan at the Collective Brewing Project in Fort Worth this spring. Ram Dantu, professor of computer engineering, was a 2017 Tech Titans finalist. J.B. Floyd ('48, '50 M.M.) reflects on how a summer camp changed the course of his career. UNT alumna and senior U.S. district judge Hilda G. Tagle receives major award. I'm busy remembering the "new" Union Building in 1973. I could hardly believe its wonders. Mark Donald, a lecturer in UNT's Mayborn School of Journalism, tackles playwrighting. Alum John Ford Coley reminisces about Denton as a 2017 Arts Walk of Fame honoree. Alumnus Pramuan Burusphat ('79 M.F.A.) is considered a pioneer of conceptual photography. UNT focuses on serving students for today and tomorrow. Christopher Penney, assistant professor of management, talks business. UNT pulls out all the stops to welcome new students to campus. Jackson Robinson ('06) created a company that specializes in luxury playing card designs. What do you wish someone had told you before you got to college? Assistant Professor Jason Bergman's music inspired by UNT faculty and alumni. Alumnae combine love of Texas-Mexico border and fibers in Tierra Firme project. Christopher Brian King ('08) has designed covers for Doubleday, Melville House. Art history professor Nada Shabout cited as an influential art historian. Alumna Yacine Ndiaye ('16) will study at the University of Geneva this fall. Jamie Brooks ('11) was a student in Amarillo in 1997 when a hit-and-run left Brian Deneke dead. Pia Wood has been named the new vice provost and dean of international affairs at UNT. Celebrate your UNT spirit by wearing green on Fridays and taking Flat Scrappy with you. Students broadened their skills in special education during a trip to New Zealand and Australia. A UNT class turned voices from Denton's Quakertown past into an interactive video tour and app. Funding from Lease Analytics will go to UNT's Human Intelligence and Language Technologies Lab. Career Connect's ePortfolio system allows students to document their real-world experiences. Professor Gayatri Mehta continues her study of the UNTANGLED online game series. UNT's Jim McNatt Institute for Logistics Research shepherds consortium.